Successfully Added LED Color Light Bulb (Waterproof, Wireless Remote) to your Shopping Cart. 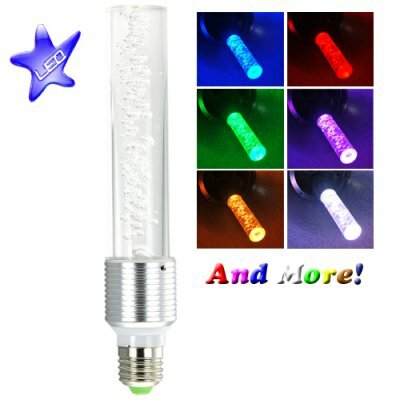 High Power Waterproof LED Color Light Bulb with Wireless Remote - the next generation 16-color LED light bulb is now waterproof and available and in a unique cylindrical, crystal bubble style. LED lights have now become the ideal choice for lighting due to being highly energy efficient and maintenance free. This new high power waterproof version brings with it a soft diffused glow of colored light to decorate and highlight a space and is perfect for creating a completely different ambiance and feeling. Forget those tedious hours of soldering resistors or having to remove and replace your existing light fixtures, with the G190 all you have to do is simply screw these LED's to your standard light bulb socket to instantly modify your decor. Aiming to give your home some extra flavor? Own a small business and want to really make your space stand out? Then get rid of that ancient incandescent light bulb and replace it with this unique crystal bubble LED color light bulb. With 16 different colors (including white), this new lighting option is great for retrofitting existing ceiling lights, downlights, pendant lights, and wall sconces. You can also control the LED color light bulb's 4 unique lighting modes to set the mood for any occasion. This highly convenient and versatile High Power Waterproof LED Color Light Bulb (Wireless Remote) was designed to provide multiple options for your lighting needs at a low factory-direct price. In stock and available for bulk quantity orders now, get yours today and add color to your life. This light bulb may be a bit larger.. do you have a smaller one? Indeed we do, but the beautiful crystal bubble design was meant to be seen and admired! This light bulb was designed for pendants or downlights, but that doesn't mean it can't be exposed too!